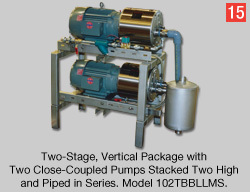 Two-stage vacuum pump packages include two, single-stage pumps mounted either back to back or stacked two high on standard, stainless steel bases and piped in series. These packages include a stainless steel separator/muffler and a service liquid line. Internal stainless steel pump parts are 316 and external stainless steel parts are 304. They are completely factory assembled for easy handling and fast installation on the job. 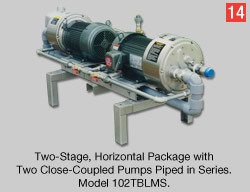 Although these packages use two, single-stage pumps instead of one two-stage pump, they take up little floor space, operate quietly, have low service liquid requirements (2-3GPM Water) and are easier to field service. They are easier to field service because they can be disassembled and reassembled more quickly without losing important clearances. Also, they can be more easily removed to a maintenance shop for bench repair when compared to the bulk and weight of a single, 15 or 20HP, two-stage pump. Special pricing for stand-by pumps is available to Lyco Wausau owners. Pricing usually compares favorably with other makes when complete stainless steel construction is considered, including pumps, bases and separator/mufflers. Field conversion from a Lyco Wausau single-stage package to a two-stage package can be easily done and conversion parts are vailable for doing this. *2) Separator/muffler connections, top and bottom 2" OD tube.